Pancakes for two. A small batch of pancakes for one or two people. Perfect, buttermilk pancakes recipe that makes just 6 pancakes. I like to think that you guys know you can count on me. I’m not entirely sure if I’m your girl when it comes to weekend baking projects, since weekends are for intense, all-day baking, and my recipes are all so simple. (Did you know that I actually wrote a whole cookbook on simple desserts for two that requires less than 10 ingredients?). Dessert for Two is more about getting a sweet thing on your plate quickly without using many ingredients. And when you want pancakes, you probably don’t want 16 of them. 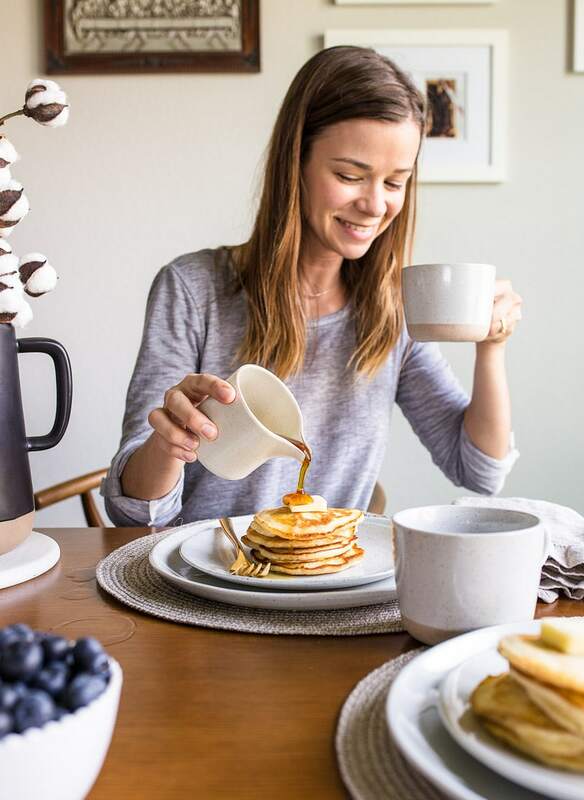 The number of times I want to make my family a small batch of pancakes compared to the times I host big brunch parties is staggering. Usually, a small batch of pancakes suffices. My recipe makes 6 perfect, fluffy pancakes. That’s two stacks of 3, if math isn’t your strong suit. This recipe is actually 15 years old. I scaled down a recipe for pancakes when I was in college, way before food blogging existed. It was just me and my roommate, also named Christina, and we wanted pancakes one weekend morning. We didn’t need the internet’s recipe for 16 pancakes, because college girls don’t plan ahead and freeze pancakes, of course. So, I divided a recipe by 4 and tested it. It took several attempts, but I landed on this recipe and haven’t wavered since. Fun story: when our current house was being finished, my husband and I lived with my parents for 6 weeks. 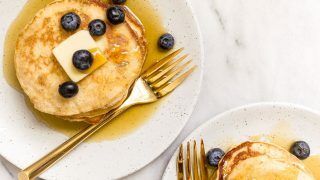 One morning, my mom served these pancakes to me, and I exclaimed ‘OH MY GOSH, THESE ARE THE BEST PANCAKES I’VE EVER HAD,’ to which my Mom laughed, because it’s my recipe. She used the recipe from my second cookbook, Comfort & Joy: Cooking for Two. It had been so long since I’ve made pancakes, I must have forgotten how good these were. These aren’t just fluffy standard pancakes. They have crisp edges and a pleasant tang from the buttermilk that pairs so well with smoky grade B maple syrup. (Use whatever syrup you like, of course). 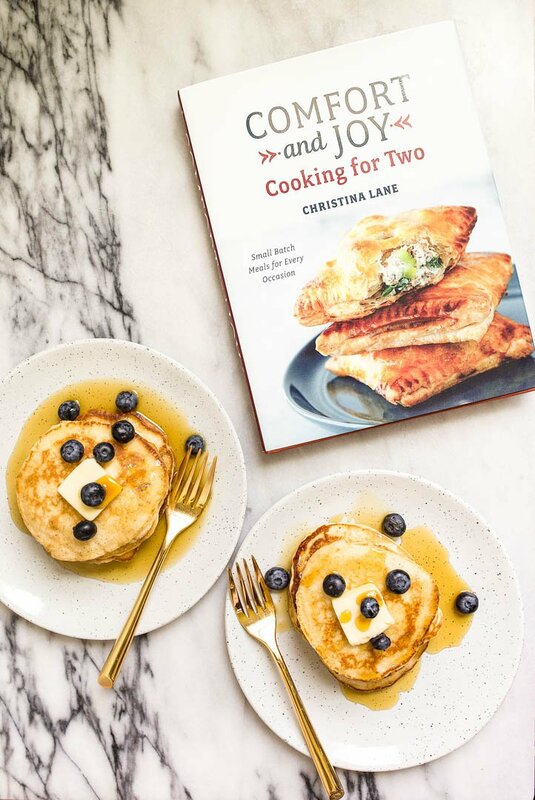 I have to say, these pancakes for two aren’t the only amazing recipe in my cookbook Comfort & Joy: Cooking for Two. To date, it’s the only cookbook I have that has savory recipes! It has small lunches, dinners for two, and comfort food meals for two also. I’m currently writing my next book, Dinner for Us: Delicious and Easy Recipes to Cook Together, (pre-order link only!) that has more savory recipes, but in the meantime, try this book! If you lack buttermilk, watch the video for a quick tip on how to substitute regular lemon juice and milk for buttermilk. My daughter normally eats my 3-ingredient toddler pancakes, and had never eaten these real pancakes until last week. She’s now a fully converted pancake lover like me. No more healthy pancakes for her, hah. Lucky me. 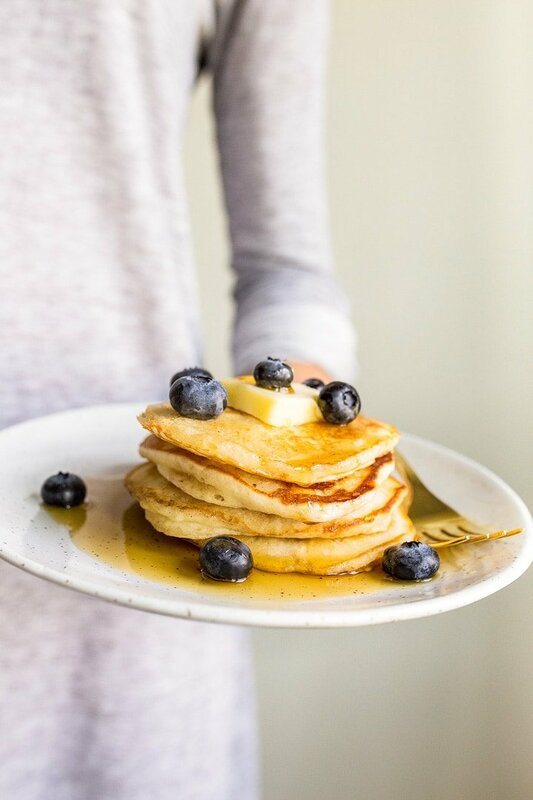 Small batch pancakes: your new weekend plan. I love that this recipe for pancakes for two can be made all in one bowl, and requires very little effort. It can even be made with eyes only half open and one hand firmly gripping a coffee mug. If you’re one who plans ahead, go ahead and whisk the dry ingredients together the night before. Leave the bowl by the stove, and then all you have to do is pour in the wet ingredients in the morning. 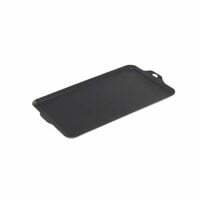 I use a griddle pan that fits over two burners to cook all of the pancakes at once, because it saves so much time. Plus, I don’t have to turn on the oven to keep the first few cakes warm. Finally, take a tip from my Mama: melt a big pat of salted butter into the maple syrup when you warm it up. In a small bowl, whisk together the flour, baking powder, and sugar. In a large glass measuring cup, whisk together the buttermilk, egg, 2 tablespoons of the melted butter, and the vanilla. Stir the wet ingredients into the dry ingredients. Stir just until no dry pockets of flour remain, but don't worry about lumps in your batter. Over-mixing will prevent tender, fluffy pancakes. Meanwhile, melt the extra butter in your skillet or griddle over medium heat. Using a 1/4-cup measure, scoop out batter onto the preheated the skillet. Cook until bubbles appear across the entire surface, and then flip to cook the second side until golden brown. Repeat with all remaining batter. 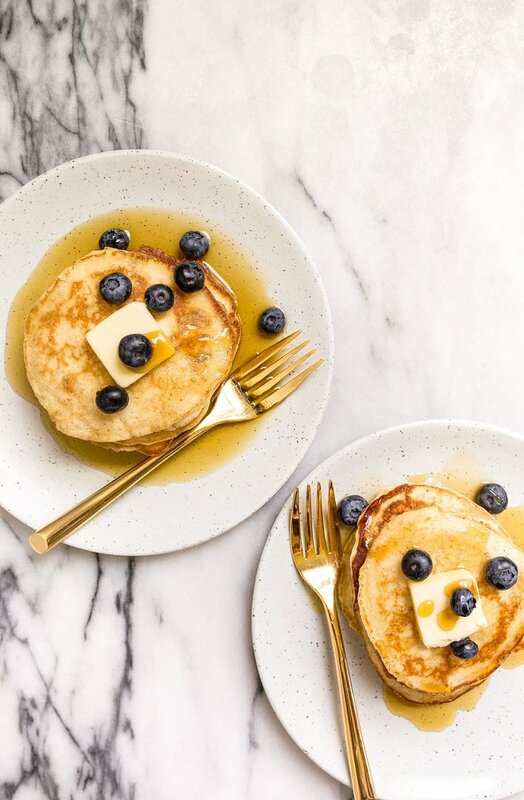 Serve with maple syrup, extra butter and fresh blueberries. Hi there! Just signed up for your newsletter and this is the first amazing recipe I received! Can’t to make these as my husband and I just became empty nesters. Question. In your video, you mentioned using a 1/3 cup to scoop out your pancake batter but the written recipe calls for a 1/4 cup. Can you please clarify? Thanks so much! You still haven’t changed the 1/4 cup scoop direction in the written instructions. Fortunately, having skipped the video, I read the comments and knew to use 1/3 cup measure. I make this recipe pretty often…in fact, just made it today and my son had it for lunch after some work on his braces. It’s just as you said – fluffy and a little tangy; it’s so easy and makes 6 good-size tasty pancakes. Thank you for this (and the many other) simple recipes! My family of 4 would laugh if I only made 6 pancakes, but I will try the trick about adding butter to the syrup next time I make some. I’ve never heard of that before. On another note, I am in love with your dishes and would really like to know where you got them! These are the best pancakes I’ve ever made! I’ve tried at least a dozen recipes, but something about these was so much better than others. I also (accidentally) added double the vanilla, but they turned out really well. I also love that we aren’t swimming in pancakes. Thank you! Thank you so much, Jessica! You are so sweet! 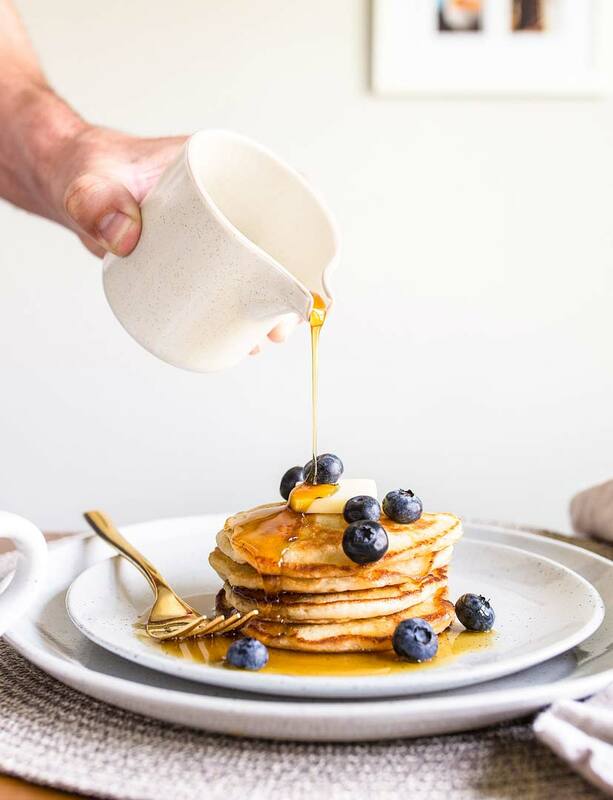 I can’t believe how incredibly easy it is to make pancakes and it’s probably the breakfast option which I can’t get myself to cook in the morning! I can put together breakfast burritos, eggs benedict, oats, bagels with all sort of things, I even make our own weekly batch of sandwhich bread for morning toasts!! but pancakes…. I can’t seem to find the willpower to make them! I the fun part is that I love them!! you have a gift… and this is it to make me lose my lazyness for some things. Corissants, or puff pastry for instance, I love your small batch recipe and it works wonders! I always have some ready to use, and I’m willing to give this pancake recipe a try, for sure! LOL Hopefully it’ll get rid of my pancake lazyness. Have a wonderful filled with pancakes weekend! These look delicious! However, I made 18 pancakes tonight and am only left with three leftover 🙈. My boys love pancakes, particularly with buttermilk. Could I easily double this recipe? Hah, Amanda! Yes, easily doubled :) Enjoy! I have all three of your cook books and just love trying the recipes. Since it is just me and my husband like person (we are retired) these cook books are perfect for us. Thank you! Thank you so much, Donna :) it’s nice to meet you! These look so good I just want to eat all 6 myself. That’s ok, right? Because small batch == healthy? That’s the story I’m going with anyways. These are PERFECT. Easily the best pancakes I’ve ever made. Quick question: Do you ever add salt to this recipe? I didn’t see salt in the ingredients or instructions. I made it as written and the first pancake was a *little* lackluster, so I stirred a little salt into the remaining batter and it made a world of difference. Seriously so good. This recipe will be on repeat forever! Just picked up some fresh blueberries. Any trick to adding them to the batter? These are fantastic. I made them in my Cuisinart Breakfast station so the pancakes were a little larger but perfect for my husband and I — one for me and two for him. Very fluffy, browned beautifully and I added some blueberries to batter. Hi Christina, last weekend I made your pancakes for my husband and myself. They were such a hit that he wanted me to make another batch right after he finished his portion. Which I did of course! ;-) I will definitely make them more often. Thank you for your recipe from The Netherlands. I know you know this is an amazing recipe – but here’s one more confirmation! I even tried my hardest to screw it up (skillet wasn’t hot enough and I overcrowded the pan) but they still turned out spectacular. I threw some blueberries in the batter and I swear they were blueberry muffin pancakes. Next time I’ll add a pinch of salt and/or salted butter just because I’m a savory gal! Congratulations, these are phenomenal! Great recipe! I added some cinnamon and ginger to resemble a breakfast I had at a restaurant. It was delicious!!! I’ve just recently found your site and am so happy I did! My hubby and I are empty nesters and I love to cook and bake, but don’t love the leftovers! I’ve tried your cinnamon rolls so far and they were great and ‘just enough’ for us. Can’t wait to try these pancakes! I’ve made these twice and ADORE the crispy edges! The first time my buttermilk was a little old…so made again and wow, will never look back on any other pancake recipe! Also, love your website and recipes as it’s just me and now I can enjoy all my favorites without eating them for a week straight! yesss these pancakes do look flawless!!! Just made these this morning. Absolutely delicious. I’ve stayed away from buttermilk recipes as the pancakes were always to thick and burned. These came out golden and fluffy. Will cut back to 1 tablespoon sugar. Made 4 large pancakes. With remaining dough I used 2 tablespoon per pancake, cute size, which I will use when making these for a brunch. Excellent recipe for my wife and I! Very tasteful! I added a teaspoon of cinnamon and 1/2 of a medium size Granny Smith apple chopped up! I served it with homemade maple syrup and toasted pecans! It was an excellent breakfast with smoked Canadian bacon and fresh ground coffee and squeezed orange juice! Just made these this Sunday morning for me and my partner. These have to be the best pancakes I’ve ever made! I’ve tried this recipe twice and both times the flour clumps into little balls when I pour in the wet ingredients. I stir but these flour balls don’t mix into the batter and the batter never blends into a smooth mixture – it resembles runny oatmeal. I even tried a whisk (not hard, so as not to toughen the batter) but it’s a globby mess. The thin batter spreads all over the skillet and the pancakes come out flat, not fluffy. Any ideas where I’m going wrong? Thanks. These are great! We don’t drink milk so I used unsweetened regular almond milk and they still turned out great (I’m sure they’re better with buttermilk) . I sautéed some apples in butter, brown sugar and cinnamon and put them on top and my husband loved them! Thanks so much! Could I use heavy whipping cream in place of the buttermilk? Well, I just got done with these and they were a HUGE hit. I was able to feed all 3 of my boys and my hubby. The recipe was perfect for 6 normal size pancakes and 1 just a little smaller that was perfect for my 1 year old. I used 1/3 cup for each of the main 6 pancakes (because I saw your comment about the perfect size), and the only changes I made was to add just a tiny pinch of salt and to use regular milk because I didn’t have butter milk or lemon juice on hand. Still absolutely perfect. The boys actually cleaned their entire plate without us having to get on to them once and that is some kind of miracle. Will definitely be making these over and over! Next time I will definitely try with the buttermilk. Thank you for sharing such a fantastic recipe! I’ve always had an issue making pancakes. Honestly…even pre made mixes! I am a good baker, decorate and sell cakes and cookies…can basically follow any recipe for meals…and STiLL can’t make pancakes…LOL! I had an epic fail the other day with a recipe I found. I was determined to master this!I found THIS recipe and it was easier, less ingredients, and OMG! I made PANCAKES!! !